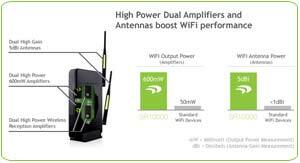 The High Power Wireless-N 600mW Smart Repeater expands the range of any 802.11b/g/n wireless network by repeating the signal from a wireless router and redistributing it in a new, "extended" location. The SR10000 is equipped with advanced dual 600mW amplifiers and 5dBi detachable high gain antennas to extend Wi-Fi coverage by a staggering 10,000 sq ft. The Premium Series Smart Repeater features network bridging capabilities that allow additional networking devices such as PCs and network switches to attach to one of the five available wired network ports for network access. The Premium Series Smart Repeater works with all Wi-Fi networks and is simply the most powerful universal Wi-Fi range extender on the market. 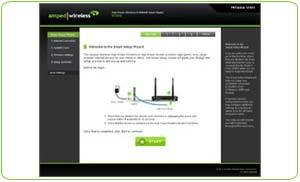 Easy setup: The Smart Setup Wizard automatically configures your Internet connection and wireless network. Connectors and Ports for the SR10000. 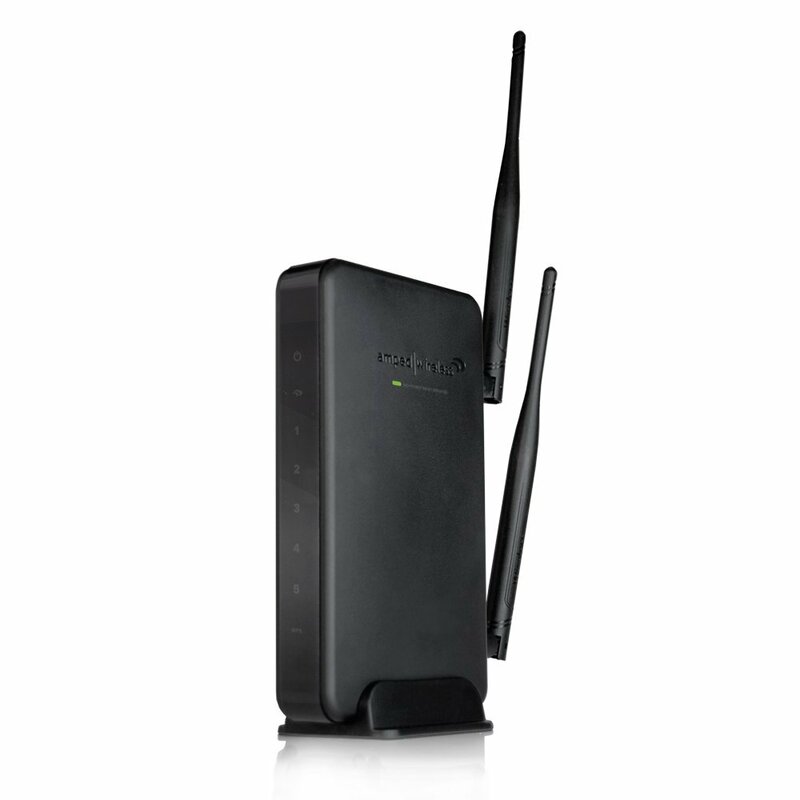 Expand the range of your existing home or office wireless network by repeating the existing Wi-Fi signal. Dual high power amplifiers and 5dBi high gain antennas provide the extra boost needed to increase your range by up to 10,000 sq. ft.
High power 600mW amplifiers and high power antennas provide powerful Wi-Fi coverage that easily penetrates walls and Wi-Fi obstructions to eliminate hard-to-reach wireless dead spots. Add up to 5 additional wired ports for connecting PCs, servers, printers, A/V devices, such as Internet-enabled televisions, Blu-ray players, game consoles, and much more. You're in control. Smart security features allow you to restrict access to specific users, set a daily time schedule for when the network is available and when it is not, and control how far your extended wireless network coverage reaches through wireless output power adjustments. The Smart Repeater also supports secure push-button setup for WPS-enabled devices. The Smart Setup Wizard connects the High Power Smart Repeater to your home or office Wi-Fi network in minutes. Simply enter the setup URL, scan for your wireless network, select it and you're done. The high power Wi-Fi capabilities of the High Power Smart Repeater is great for extending wireless coverage for larger homes, backyards, offices, and warehouses. The SR10000 includes a free Wi-Fi Analytics Tool Android App to help optimize and analyze Wi-Fi networks. 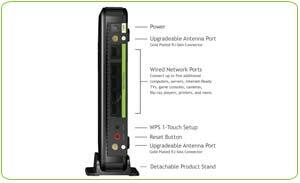 Amped Wireless High Power Wireless-N 600mW Smart Repeater, 2 detachable 5dBi high gain antennas, 1 RJ45 Ethernet cable, Setup Guide, CD with user's manual and installation video, stand for vertical mounting, warranty. *Range specifications are based on performance test results. Actual performance may vary due to differences in operating environments, building materials and wireless obstructions. Professional Series Products require point to point, line of sight, wireless connections between other Amped Wireless Professional Series products to achieve stated range specifications. Performance may increase or decrease over the stated specifications based on the overall wireless environment and conditions. Wireless coverage claims are used only as a reference and are not guaranteed as each wireless network is uniquely different. 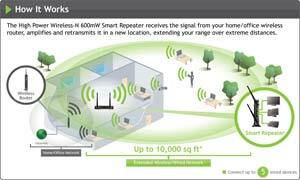 The High Power Wireless-N 600mW Smart Repeater expands the range of any 802.11b/g/n wireless network by repeating the signal from a wireless router and redistributing it in a new “extended” location. The SR10000 is equipped with advanced dual 600mW amplifiers and 5dBi detachable high gain antennas to extend Wi-Fi coverage by a staggering 10,000 sq ft. The Premium Series Smart Repeater features network bridging capabilities that allow additional networking devices, such PCs and network switches to attach to one of five (5) available wired network ports for network access. The Premium Series Smart Repeater works with all Wi-Fi networks and is simply the most powerful universal Wi-Fi range extender on the market.